Two tier cake to your chosen design customised with your age/theme & name. Check out our celebration cakes. X3 Round giant confetti balloons with tulle tails. 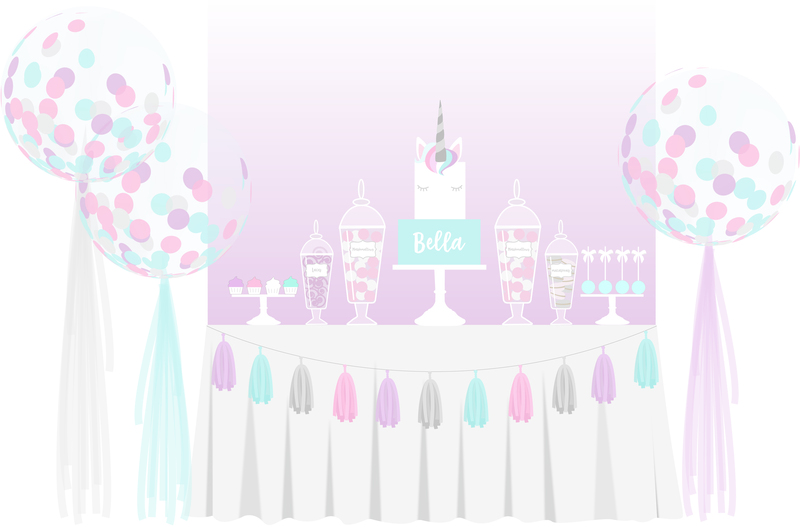 Unicorn cake table dressed with tablecloth, hand made tissue paper tassel garland and table runner. X2 Stands of personalised bespoke cupcakes & cake pops. See our cupcake gallery. Large & medium glass bonbon jars filled with sweets & treats matching your colour scheme. Elegantly plated personalised biscuits, sweet treats & chocolates. View our candy buffet gallery for inspiration. All Antonia’s Candy buffets are decorated with customised sweet labels, ribbon detail & come with sweet scoops & treat bags. Why not personalise your event and spell out any message, name or age with jumbo foil balloons. (£8.50 per letter) Thay make the perfect dancefloor or buffet back drop! Create the perfect party atmosphere with our led balloons for just for £1. Add sparkle to your ceiling and wow your guests with a magical twinkling effect. See our balloon chart.